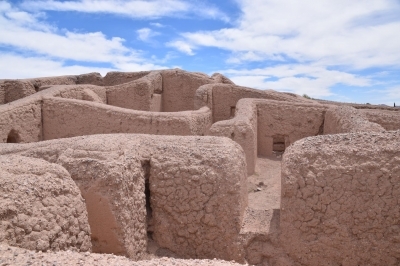 The Archeological Zone of Paquimé, Casas Grandes is a pre-Columbian archaelogical site. On our US road trip in may 2018, we spent a day going south to visit Paquime. From Tucson we crossed the border at Aqua Prieta and we had no trouble crossing the border. We bought Mexican car insurance from Thrifty, one of the few car rentals that allow driving into Mexico. We had very few expectations to the Mexican road trip but were really surprised. The first 100 km along the US boarder was very scenic, with mostly good roads. Paquime was very calm. On a Saturday there were a few other Mexican tourists around, but “none” foreign. Paquime is largest pre-columbian site in North America. The visitor center was informative and explained well the city and people living there, and had a small, but nice exhibition of pottery and figurines. The people of Paquime were excellent craftsmen. The city was established in 1100 century by people coming from north. The citys construction was made up of innovative adobe techniques. They built multi-familiar complexes, some of them counting four floors and more than 1700 rooms. That’s why the Spaniards called the place Casas Grandes. It was called Paquime by the natives who lived there for about 300 years. The multi-family complexes and the T-shaped doorways is significant to the city. Later we also found traces of those doorways in Chaco Canyon, but not to the same extend. 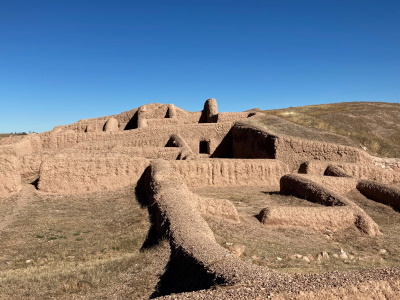 There were also open plazas for markets, ceremonial structures, mounds with architectural features in the form of decapitated birds, ball courts in meso-american style and astronomical functions. The success of the city is observable in how they controlled water. They build hydraulic systems from the mountains of Sierra Madre to the valley used to provide the city with water and to irrigate its fields. Water was distributed through dikes, irrigation canals and ditches. It was cisterns contained drinking water for the people. Drainage systems were built to avoid flooding. They also had a canal system to distribute water into the houses for domestic use. There were many similarities to what we later saw in Chaco Culture and Mesa Verde like the Kivas and the odd T shaped doors. Paquime is not the grandest of archeological sites in Mexico, but an interesting visit. On our way back, we crossed the border at Puerto Palomas into New Mexico south of Columbus. Except for half an hour wait we had no troubles going back to the US. P.S We later found out that the area, Chihuahua, is not safe to travel in do to narco-wars. There have been incidents of killings, including tourist, but we didn’t encounter anything scary and felt safe. Paquime is a great place to visit, it is not that far from the border with Texas and New Mexico. You can even visit it for a weekend getaway. The museum is excelent, and it is not expensive. While in the area, you can choose from various hotels and good restaurants. For all of you guys who always have to be checking your e-mails, you can visit "El Cybernetico" an internet cafe in Nuevo Casas Grandes. Casas Grandes is a 50 mile drive south of the New Mexico, USA border into Chihuahua, Mexico on a good highway. The adobe or mud city is partially restored and provides a good example of how the pueblo native americans settled down. The adjoining museum is excellent. Nuevo Casas Grandes is just 15km down the road with great restaurants and motels. Also, you don't need to speak Spanish to get there. Like other pueblo indian sites, the dwellings are apartment style buildings with everyone living in close quarters. Bureau -pending the results of a comparative study of property of this type located in Mexico and the United States.